Seniors across the country have joined the social media world. They are the fastest growing demographic on Facebook, and they are getting great enjoyment out of their social media interactions, not to mention enjoying the many health benefits of social media for seniors. 1) Staying in Touch – One of the benefits of social media for seniors is that it allows them to keep in contact with loved ones. Social media is a great way for seniors to reengage with past friends, schoolmates and roommates. In addition, it is a fun way to stay in touch with their kids and grandkids, which in turn helps bring them closer to their families. Seniors are not allowing distance to come between them and their younger family members. Instead, they are stepping out of their comfort zone so that they can communicate the way their family does. 2) Entertainment – Most people use social media as a form of entertainment and that goes for seniors too. 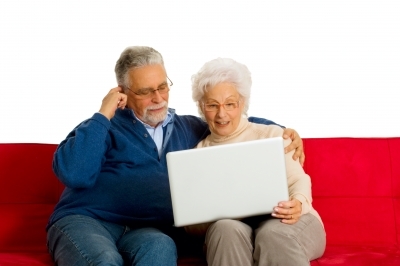 Not only is entertainment fun, but it’s one of the benefits of social media for seniors. As seniors enjoy fostering a hobby by engaging with like-minded people on social media groups, they bring more happiness and health into their lives. 4) Encourages Interaction – With many seniors living more isolated lives, social media is a way that they can bring more interaction into their lives from the comfort of their own homes. 5) Keeps Seniors Sharp – Learning something new, like social media, and stimulating the mind keeps the brain sharp and helps prevent dementia and Alzheimer’s. This is one of the best benefits of social media for seniors. While social media is proving to be a benefit that many seniors are enjoying, precautions do need to be taken because it is easy for someone who is unfamiliar with technology to run into some traps. Set up privacy settings on your social media networks to ensure only the people you want seeing your posts are seeing them. Be wary of scams. Stay away from anything that seems too good to be true and be careful clicking on links that are emailed to you from your social network (particularly from emails claiming you need to change your password). Never wire money online or give out financial information or your social security number. Know that it is possible to receive an email from someone you know that is a virus or scam. Their email account could have been compromised, so use caution when clicking on links or attachments that seem uncharacteristic of them. Refrain from giving out too much information on your social profiles. Don’t post that you are on vacation, away from your home, or home alone. This encourages break ins. Avoid giving out your credit card or cell phone number, even for free trials. This can turn into monthly billings to your credit card or phone bill. Try some social media networks that are geared specifically for seniors, such as www.eldr.com, www.genkvetch.com, www.aarp.org/onlinecommunity. Get a technology savvy family member or friend to help you with all of the above.